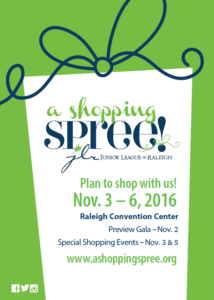 SAVE THE DATE for the 2016 A SHOPPING SPREE!! Visit our home page for additional information. 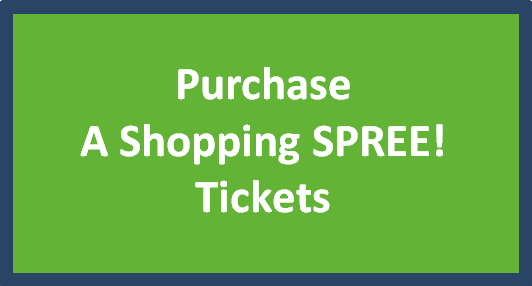 Tickets are now available for the 2016 A Shopping SPREE!! Click below to purchase yours today! Proceeds from A Shopping SPREE! help support the Junior League of Raleigh’s Center for Community Leadership and community projects, particularly in the League’s focus area of promising youth. The League has donated more than $1.6 million and more than 237,000 volunteer hours to programs and projects that impact youth in our community such as BackPack Buddies, SAFEchild, Brentwood Boys & Girls Club, StepUp Ministry, Helping Horse, Heritage Park Community Learning Center, Kids on the Block and AventWest Children’s Mentoring. A SPREE! Fund has been established to help offset the costs of the show and allow more funding for our community programs and projects. Donate now to support the SPREE! Fund. Like our Facebook page for updates about the 2016 show. Vendors interested in exhibiting at A Shopping SPREE! should visit our Exhibitor Information page and like our Facebook page for information on the show and application process.